The KAG is the end result of an ongoing collaboration between BCM® and Travis Haley, founder of Haley Strategic Partners and inventor of multiple weapons manipulation enhancements in the firearms industry. 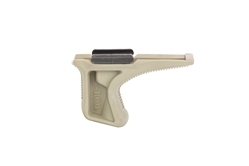 Designed to complement modern shooting grips, the Kinesthetic Angled Grip (KAG) uses a biomechanically efficient forward rake to create an interface for positive retention and joint relief to the wrist, elbow, and shoulder, allowing for smooth weapon manipulation without substantial increase to the girth of the weapon system. Textured on both front and back, the profile of the KAG creates a channel for consistent and positive engagement which translates directly into improved efficiency in weapons manipulation and target to target transitions. Made in the U.S.A. from high quality, impact resistant polymers.